Hazel conscientiously parallel parked her efficient little Jetta, with an almost perfect two feet of space in front and behind. She pulled down the visor to verify no lipstick had transferred to her teeth, gave her straight cut brown hair a little fluff with her fingertips. She could feel herself slipping into her new role, her new life, already. She was going to meet her true love for lunch, sweep in the door, prepared for that first electric moment when their eyes would meet across the room and rival the love that launched a thousand ships. She turned the ringer off on her phone and slid it into its zippered pocket in her purse. Keys, compact, lipstick, wallet, breath mints, check. As she slid out of the car, her sweater snagged on the seat belt harness. “Damn it,” she cursed under her breath. “Not now.” She pulled at the snag, tugged on it until an entire thread came out and left a noticeable hole. “Shitshitshit…” As Hazel pulled her arms out of the sweater, no help for it now, she knocked her purse to the pavement. Though she would have sworn that she had already closed it all up it popped open, spilling nearly everything in it onto the street. Her patience was wearing thin. She dropped the sweater onto the seat behind her, straightening the sleeves of her light brown cap sleeved shirt. As she bent over to gather her belongings, the heel of her left shoe turned, scraping it against the ground and leaving a scuff mark that looked to her a mile wide. Fortified, albeit a little wild eyed, Hazel stood and gathered her composure around her like a cloak as she hurried towards the entrance to the diner. A handsome man stood under the awning, smoking a cigarette directly under the No Smoking sign. Couldn’t be him, there was no way he would have a habit as common and smelly as smoking. The man eyed Hazel sideways as she scurried past him to reach for the door, stifling a laugh at the disheveled woman who probably didn’t know that she had some kind of stain on the knee of her pants. As her fingers closed around the old timey wrought iron handle, a sudden gust of wind blew so strongly that the cherry of the man’s hand rolled cigarette blew right off the end and hit Hazel’s hand. It jumped away from the door handle and she spun around indignantly to tell the man just what she thought of his nasty habit, but he was gone. Startled, Hazel looked down the street but he was already half a block away. She shook off the moment and reached to open the door again, barely jumping out of the way as a couple too tipsy for early afternoon came barreling out of it. They giggled to each other and nodded a greeting to Hazel as they weaved away. With grim determination Hazel gripped the side of the door before it could swing shut again and stepped into the diner. Marching forward, all thought of a gliding entrance forgotten, she stopped short at the hostess podium. “May I help you?” asked the woman with lovely raven colored hair behind it. “Oh. Um. I’m not sure, I couldn’t read his letter.” She thought for a moment. “He’s dying to see me, though,” she added, with a winsome smile. Hazel’s mounting panic was interrupted by a polite cough behind her, followed by a voice as mellow as aged scotch. “Excuse me, are you Hazel?” For a moment, Hazel watched the reaction on the raven haired woman’s beautiful face. Her eyes widened and warmed with surprise and appreciation, her lips parted as she let out a soft breath. Oh my. Hazel turned into the hand that cupped her elbow gently, and her gaze travelled up to the face of the man who stood less than a foot behind her. He was dark where she had expected light, but her fantasy did an immediate re-write to include deep eyes that glittered like obsidian chips under straight strong brows, full dark pink lips currently curved into a hesitant smile over a cleft chin, and thick almost black hair that fell rakishly to his shoulders. “Yes, yes, I’m Hazel. You must be…”she faltered as she realized she had no name for him. As his smile widened, for just a moment, something flickered in those shining eyes, something that felt cold, sepulchral and cold. A trick of the light, she admonished her racing heart. Her mind tried to quietly point out all the strange happenings that seemed almost contrived to keep her out of this diner. There are warning bells clanging somewhere in here, her mind said, if you would just stop and listen for a moment. 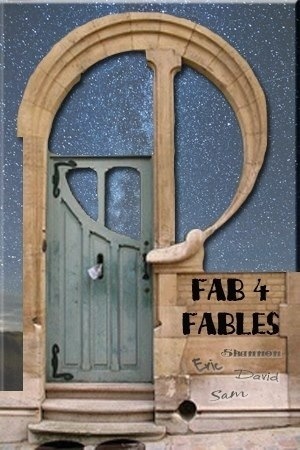 The Fab Four Fable was started as a colloboration between some of the original members of Sinistral Scribbling’s Master Class writing meme. SAM from My Write Side wrote the first part of this go round and tagged me to write the second. For the third part, I’m tagging David Wiley at Scholarly Scribe, which will leave Eric at Sinistral Scribblings to finish it off. Really? It’s so much fun…. 1. No one will be privy to the story until it is posted. 2.The next person won’t know who they are until they are tagged, when the post goes live. 4. There is no word count or time limit. i love the visuals that bring both Hazel and the mysterious stranger to life. You captured the Hazel in my mind perfectly, Too! I’m sure this is great, but I didn’t read it. Just wanted to see who you tagged and since it wasn’t me, I’ll wait until David is done before I read anybody’s (that’s right I STILL haven’t caught up with SAM’s blog). In SAM’s part, I was rolling my eyes at the love-struck way Hazel was acting and just KNEW things weren’t going to go well for her. Here, you manage to take that poor woman and ground her into a harsh reality that compliments SAM’s version of the character very well and have confirmed that things aren’t going well. Nice job! Well thank you so much 🙂 I did have fun with it, I’ve known women like that (not closely, thank goodness), but I could totally see what SAM was going for.